Today was a very long day. I was all packed and ready by 7am and hit the trail. I started off on my own, but a few villages later I met up with all of my Camino family from dinner last night at the first open Café. So from that point on for the rest of the day we walked together. It is pretty amazing to experience the changes in the landscape. Just yesterday, I started out walking through low rolling hills covered in vineyards. Gradually, it changed to forest groves with river streams flowing through them. Today, we ascended into the mountains and at the top we were greeted with vistas of rolling hills as far as the eye could see. The vineyards turned into pastures of cows grazing on the grass. We visited the chapel in O’Cebriero and lit candles for our intentions on the Camino. We said some prayers, each in our own languages. We continued on and made our way down and then up, and then down again, then up again. We walked through steep terrain and ended the day with having walked around 16 miles of rough terrain. We checked in at around 4:45 and were ready to just sit and relax. My feet hurt, but fortunately I have no new blisters. After getting settled, we went to he Pilgrims Dinner at the Albergue, and again it was an incredible experience! The first course was a home made vegetable soup, accompanied with wine made by the owners of the Albergue and nearby farm. The second was a beef stew over rice that was delicious. At the end of the meal, we had a unique experience of watching the cook make a warm liquor which is a spiced with coffee beans, apple slices, and orange peel which is set on fire. It was such an awesome experience and she said she only does it a few times when it is requested. It was a really cool experience and it brought us all even closer together. We had 35 people from a dozen different nations gathered together for this experience. What a way to end the meal! My muscles ached from the days walk, and yet it continued on even after that. As we were walking back from dinner, one of the farm dogs wanted to play fetch with a stick, and unfortunately decided that the stick of the 11 year old German girl was his to play with. It was a big German Shepherd and it didn’t want to let go. The mother was afraid of dogs, but I was able to come to the rescue much to the appreciation of both mother and daughter. I was able to trick the dog into letting to of the walking stick that meant so much to the girl, and I walked it back up the path, keeping it from the dog. I felt very happy that I was able to assist when needed and to give the girl back her walking stick when we got back to the Albergue where it was safe from the dog. Again, I had an incredible day on the Camino! 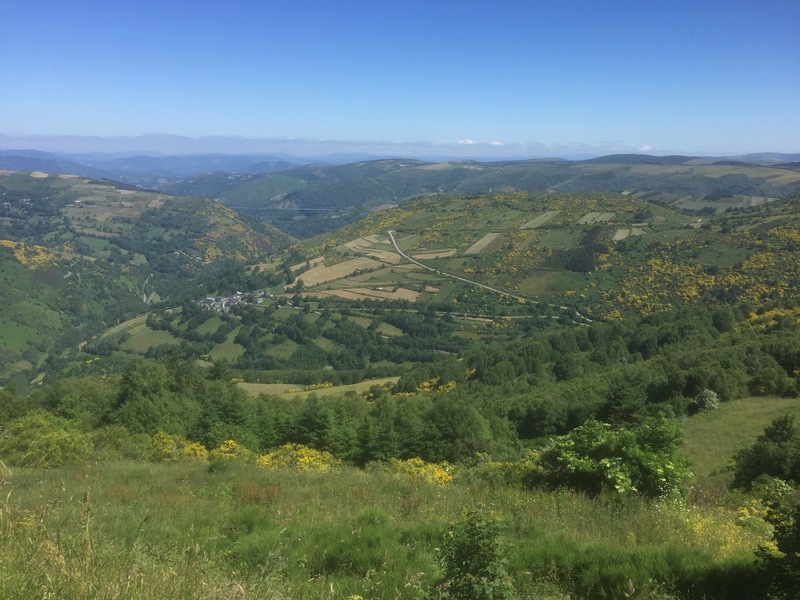 Camino Day 24: Salcedo – Santiago!